I freaking love Twitter. Probably more than I should. It’s an addiction I think. And a major part of my love for the social media service stems from — in my opinion at least — there’s really no better medium out there to discover and connect with fellow fans of the beautiful game. if you’ve ever been corrected for using the wrong hashtag in an MLS-related tweet, this post is for you. The use of hashtags in one’s tweets is one of the easiest tools to link fans together. And though sometimes overbearing and overused (something I’m most definitely guilty of), there’s really no better way to get feel for the pulse of a fan base. However, If you’re anything like me and like to throw your two cents in on just about every team’s performance, knowing which hashtags to use is oftentimes a difficult task. It’s inefficient to use entire team names, thanks in large part to Twitter’s 140 character limit and the sloth of the average human being. That’s why you rarely see anyone utilizing hashtags like the #NewEnglandRevolution or #SanJoseEarthquakes. And while it’s sometimes accepted to just use team names/nicknames, they’re often times too generic or overlap with non-soccer subjects. So supporters have naturally developed unique hashtags to identify their club’s and fellow fans’ tweets. But if you don’t follow a team that closely, it’s hard to know exactly what those unique identifiers are. 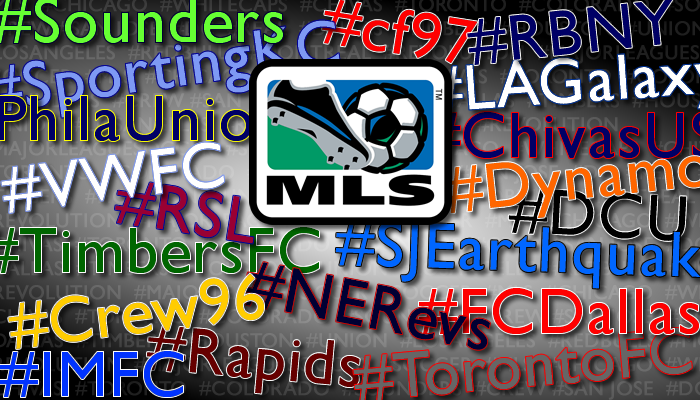 So to help make life easier for you, I’ve scoured the Twittersphere and collected the most commonly used hashtags used by all 19 of Major League Soccer’s clubs. And if you want to see how real life supporters are putting them to use, give each a click to see the latest search results. Keep in mind that this was only what I was able to dig up in my research, so if you discover a hashtag that’s out of wrong or missing, feel free to tweet it to me @wrongsideofpond, or drop it in the comments below.